Artist's impression of GRB101225A. The merging of the helium and neutron star produces a broad torus, plus two jets aligned with the rotation axis of the system. The jets interact with the previously ejected torus causing the observed black body spectrum. Image credit: A. Simonnet, NASA, E/PO, Sonoma State University. The Liverpool Telescope (LT) recently played an important role in the discovery of a new type of gamma-ray burst, as revealed in a new paper published in Nature this week (Thöne et al, Nature, 480, 72-74, 2011). Gamma-Ray Bursts (GRBs) are brief and intense flashes of gamma-ray radiation that occur randomly from any direction of the sky. Their durations range from a few milliseconds up to over half an hour. They are so energetic that we can detect them even at distances of thousands of millions of light years. Since our atmosphere is opaque to gamma-ray photons, GRBs are detected by gamma-ray instruments on board spacecraft such as NASA's "Swift" satellite. Swift localizes GRBs and distributes their coordinates (mainly through the internet) to astronomers all over the world, who can follow up these explosive events using ground-based telescopes. 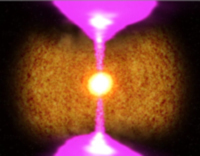 These observations have shown that GRBs are followed by fading optical, infrared and radio emissions called “afterglow”, which can be explained by synchrotron radiation emitted by charged particles moving in magnetic fields at ultra-relativistic speeds (velocities above 99% of the speed of light). On Christmas Day 2010 a peculiar GRB occurred, designated GRB101225A (after the date of its discovery), also nicknamed “The Christmas Burst”. It lasted more than half an hour, much longer than most GRBs detected so far. Its low‑energy emission (i.e. all radiation measured below the gamma-ray regime) was dominated by a strong thermal component ‑ a classical black-body spectrum ‑ while all other GRBs were dominated by synchrotron radiation. An international group of researchers, led by Dr. Thöne and Dr. de Ugarte Postigo from the Instituto de Astrofísica de Andalucía (IAA-CSIC, Granada, Spain), recently published an article on GRB 101225A in Nature. Based on a set of space- and ground-based observations, they propose a new scenario to explain this exotic explosive event. However, according to Thöne et al, the peculiar properties of the Christmas Burst require a different model altogether to explain it. They propose that the burst is the result of a neutron star merging with the helium core of an evolved giant star, at a distance from Earth of ~5.5 thousand million light-years (redshift z ~ 0.3). During the “inspiral” of the neutron star, the binary system underwent a common envelope phase where the giant star expelled most of its hydrogen envelope. The resulting explosion created a GRB-like jet, which became thermalised by its interaction with the dense common envelope, and thus gave rise to the observed black body spectrum. This ejected material was cooling down progressively from 43,000K 23 minutes after the burst, to 5,000K 40 days after the burst. 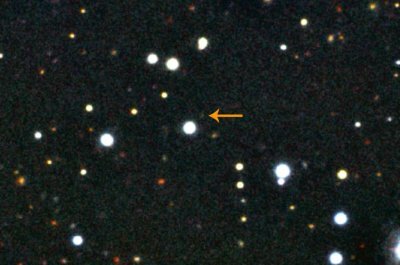 Finally, ~10 days after the explosion a faint supernova component started to emerge, reaching its maximum 40 days after the GRB and dominating the fading black body radiation. This gradual transition from a smooth black body to a supernova spectrum has not been seen before[*], and the Liverpool Telescope has been a key facility to monitor it. Liverpool Telescope observation of the optical counterpart of GRB101225A (arrowed). The image was taken ~10 days after the GRB at the onset of the supernova. Observations carried out with the Liverpool Telescope 10 days after the Christmas Burst revealed a reddish re-brightening of the optical emission which could not be explained by a mere black body evolution. The high quality data of the Liverpool Telescope revealed the optical counterpart with a reasonable error in spite of its faintness (iAB=24.01±0.13, see figure at right). This showed that the optical emission was ~0.3 magnitudes brighter than the predictions made by a simple cooling black body model. In order to study the nature of this emission excess, a monitoring program was planned based on larger aperture telescopes. Subsequent observations by the Gran Telescopio CANARIAS and Gemini telescopes confirmed the existence of a faint supernova component in both the optical lightcurve and its corresponding spectral energy distribution (SED). The best fit to this supernova component consisted in a faint Ic-type like supernova at a redshift of z~0.3 (which corresponds to a distance of 5.5 thousand million light-years). The proposed helium-neutron star scenario predicts the production of a modest amount of radioactive nickel that would lead to a weak supernova component, consistent with the observations. 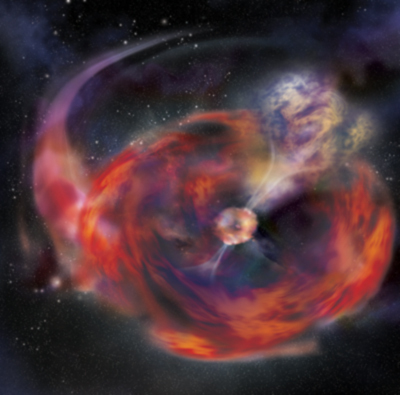 The resulting remnant could be a magnetar whose prolonged activity would explain the unusually long duration of the gamma-ray emission. Even after many years of research, GRBs can still surprise us. In the same way that the classification of supernovae has become more diverse with time, that of GRBs might have to be revisited as well. It seems stars find many different ways to die. [*] Although previously two GRBs seemed to show some evidence of this black-body-to-supernova transition. Download the movie of the simulated burst (43MB). Credit: S. Wiessinger, NASA.